The last two evenings we had very different dining experiences. 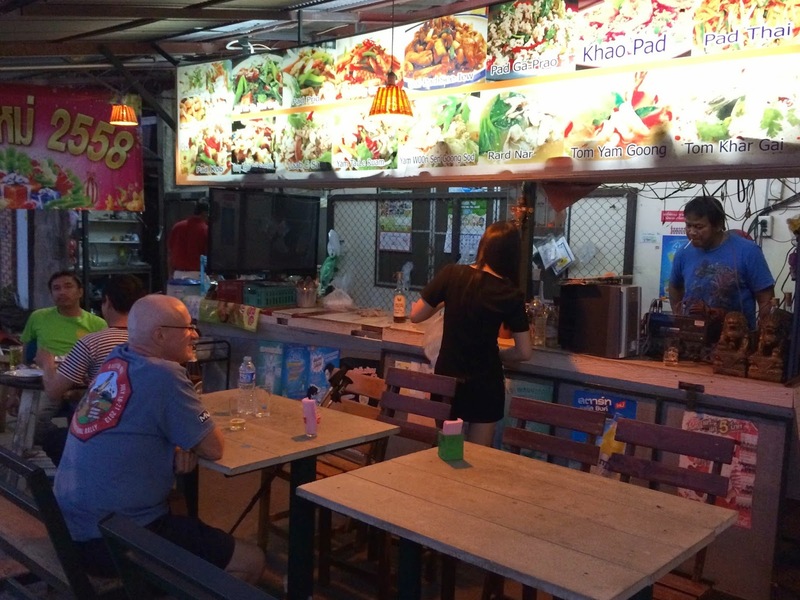 On Tuesday we went back to an open-air restaurant in our neighborhood where everything is very cheap. In the photo below, Dan's back is right on the street. It appears to be popular with the locals. They do have printed menus. The cook (a woman) is easy to watch, as the cooker is at the left rear of this picture. 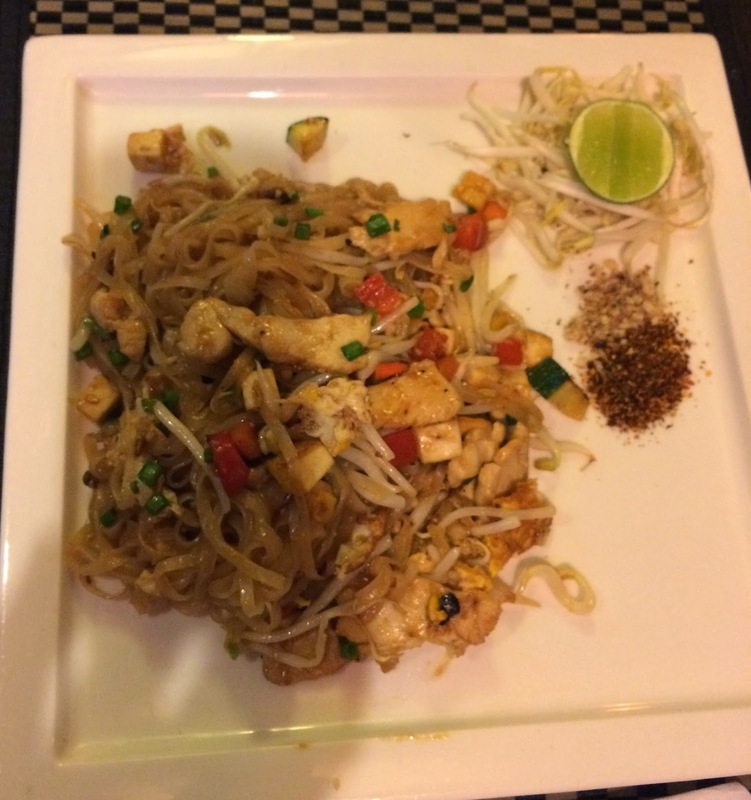 I had Pad Thai, which wasn't very photogenic, but tasted delicious. On Wednesday Dan came home in the afternoon with a "snack" of mango and sticky rice. His Thai language teacher told him the best place to get it and he has been there several times. 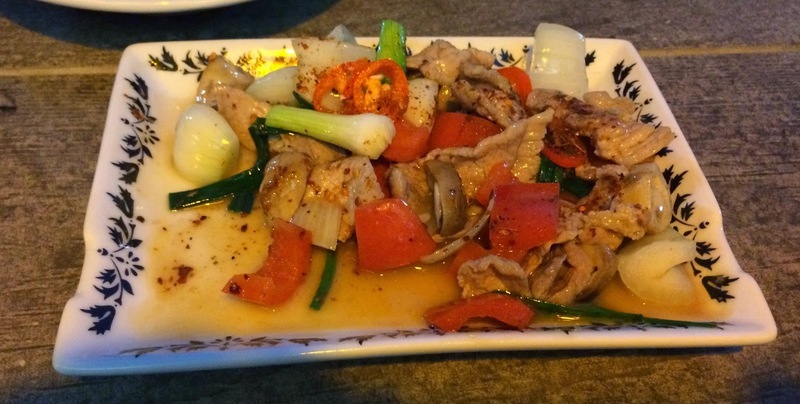 It is truly delicious! So we were ready for a lighter supper. We went back to the Doo Dee, where the manager greeted us warmly, "You came back!" 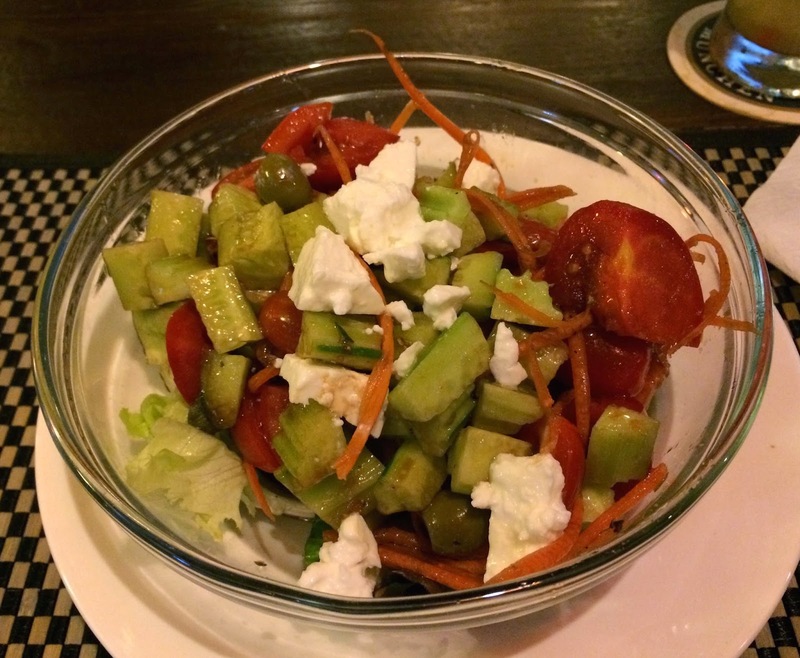 I had a Greek Salad, which was very good;' it even had feta cheese and olives. Lots of cucumber and ripe tomato, with some lettuce in the bottom. Dan had Pad Thai, which was again delicious. 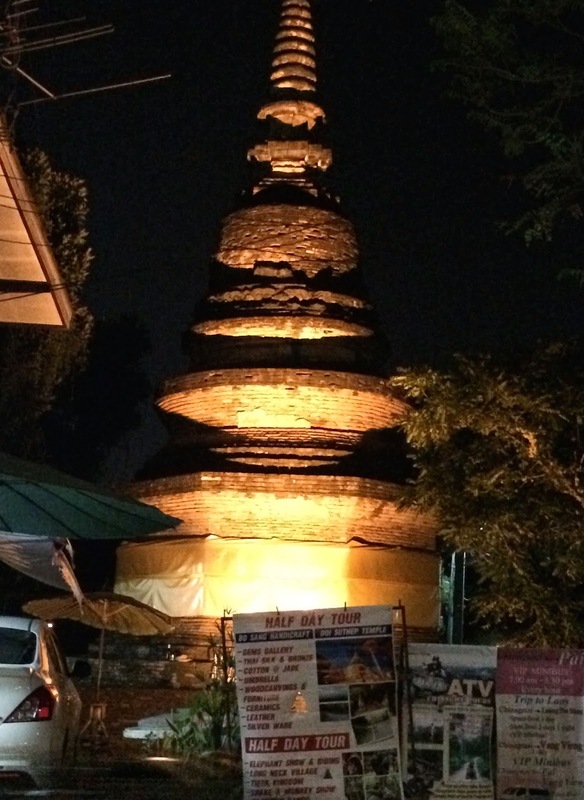 Just across the street from the Doo Dee is this old stupa, which is beautifully lit at night. 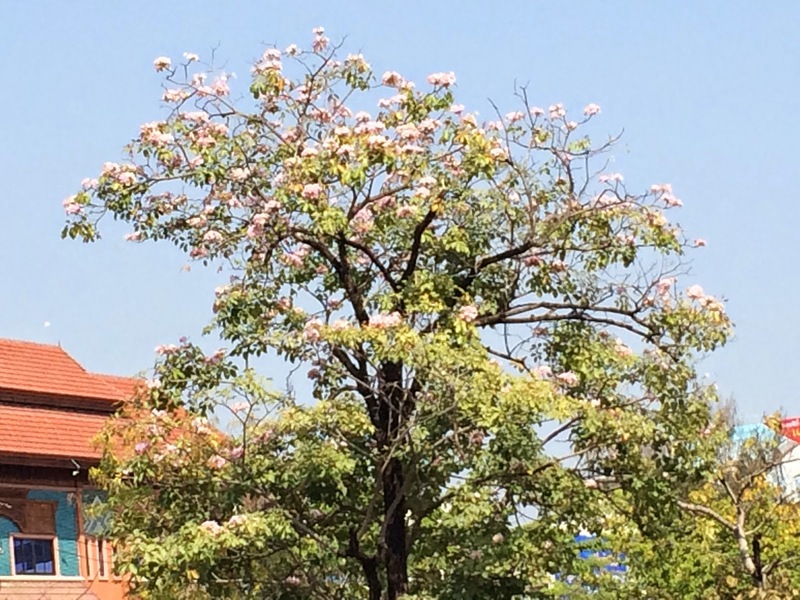 Walking along the moat, I saw this lovely tree in bloom. I've been interested in the vehicles found on the streets here. There is an unusually high number of large pickup trucks, which I didn't expect. The majority have a four-door cab and do not generally have anything being hauled. I guess it must be a status symbol. The large majority of vehicles are scooters, as I've mentioned before, but there are plenty of cars, too. They are almost all Hondas and Toyotas, with a sprinkling of Mazda and Isuzu. The occasional Ford or Chevy can be found, as well as a luxury BMW or Lexus. Oddly, I haven't seen any Korean vehicles; Hyundais are numerous in India. 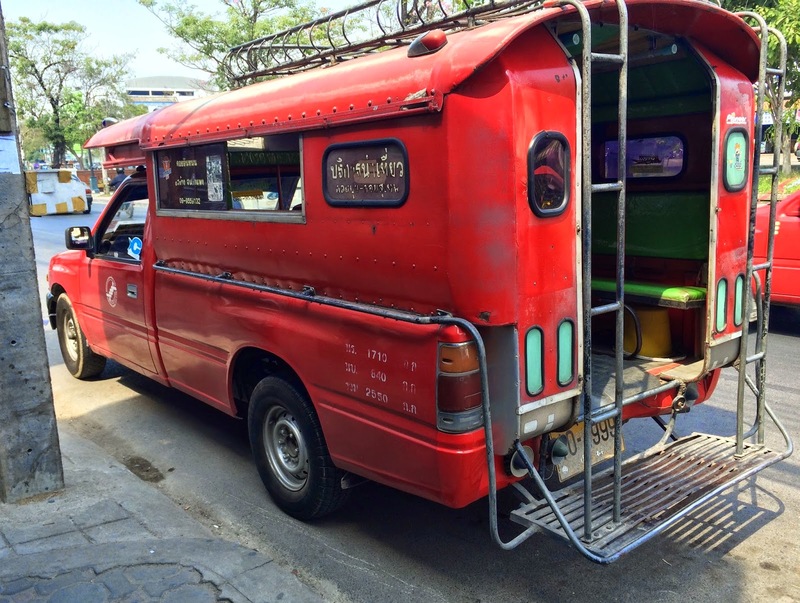 The vehicle below is a song tao, a pickup truck fitted with seats in the back. These do not have routes fixed in stone, but tend to congregate in certain places and will go where the riders want to go, if they are heading in that direction. In our area, they seem to be mostly red, although there are yellow ones, too, and some green. It is a fairly cheap ride ($.70) and lots of people use them. There are city buses as well, but they do not seem to be crowded.